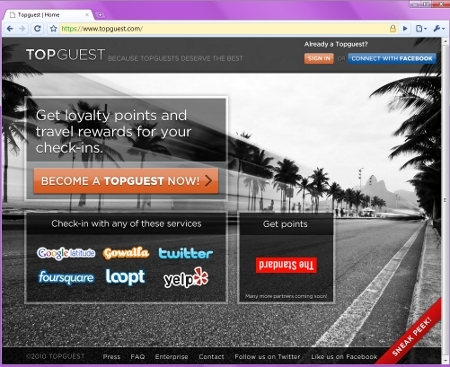 A new website called Topguest allows check-in service users to earn travel awards simply by checking in. Basically, the site works like this – you can use any or all of the following check-in services; Foursquare, Gowalla, Brightkite, Google Buzz, Yelp! and/or Loopt, and then when you check-in at a Topguest travel-focused partner and they will automatically send you rewards through your account. To make this clear, Topguest is not a stand-alone check-in service – you need to be using at least one of the above check-in services for this to work. 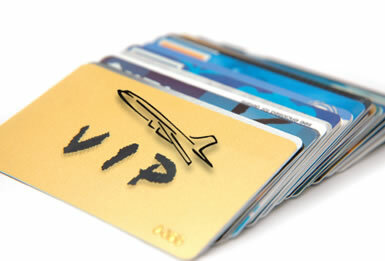 Make a unified Topguest rewards account, that will allow users to then trade-in their rewards with Topguest partners. This way, a check-in could be say worth 5 points, and then when you get to 100 points you then have a range of rewards options. This is basically what credit cards do. This just really makes things much easier for users and lets them really start saving up points now while Topguest continues to add partners (the Standard for example is a high-end hotel and you have to check-in 10 times right now to earn the 25% off your 11th booking – that could take forever). Also, while its a smart play by Topguest to go after the travel vertical, they are hardly alone in this ambition, and you can bet that many of these check-in services will also directly compete with Topguest (of course, a check-in on Foursquare could earn you double points by getting points with a Foursquare partner and then with a Topguest one, but not if they are exclusive offers). Basically what we’re saying is that being the middleman isn’t enough – especially if it puts a strain on users – Topguest is going to have to make the rewards dead simple and add special value moving forward. That said, its a nice start that makes a lot of sense.